New Orleans Red Beans and Rice. One of the most comforting, satisfying dishes in the world. Deep in flavor with a little heat…oh boy, do they get it right down in the Big Easy. We love making red beans and rice. It is always something we look forward to, and make it as often as we can. 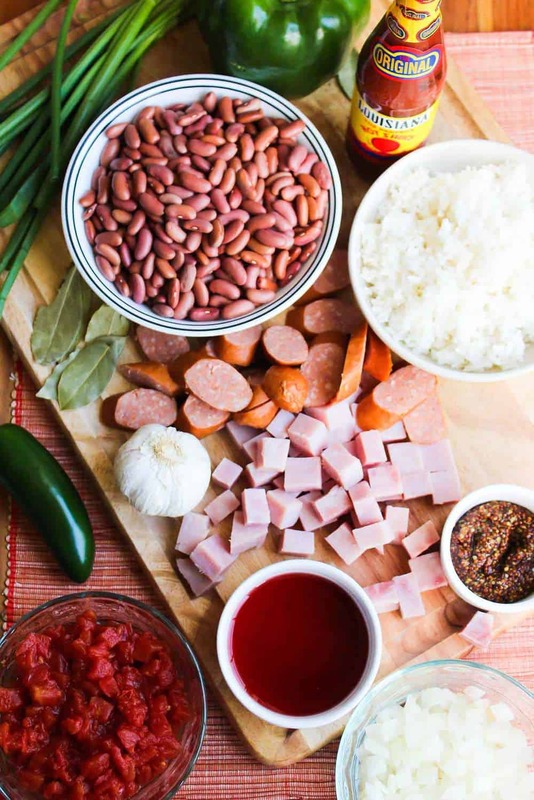 Watch us show you how easy it is to prepare New Orleans Red Beans and Rice! The ingredients in this masterpiece of recipe of Cajun cuisine work together beautifully. From the andouille sausage, to the smoked ham, to all the amazing spices and aromatics. NOLA perfection. 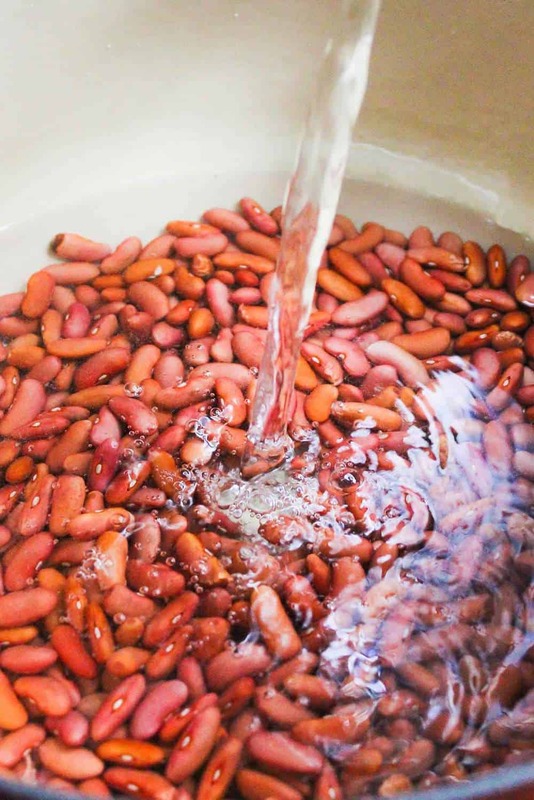 Be sure to soak your dried red kidney beans overnight. This is the best way to start this dish off. Oh, how we love this New Orleans recipe. We love the Big Easy so much, and when we’re really missing all that jazz, we make up a batch of New Orleans Red Beans and Rice. 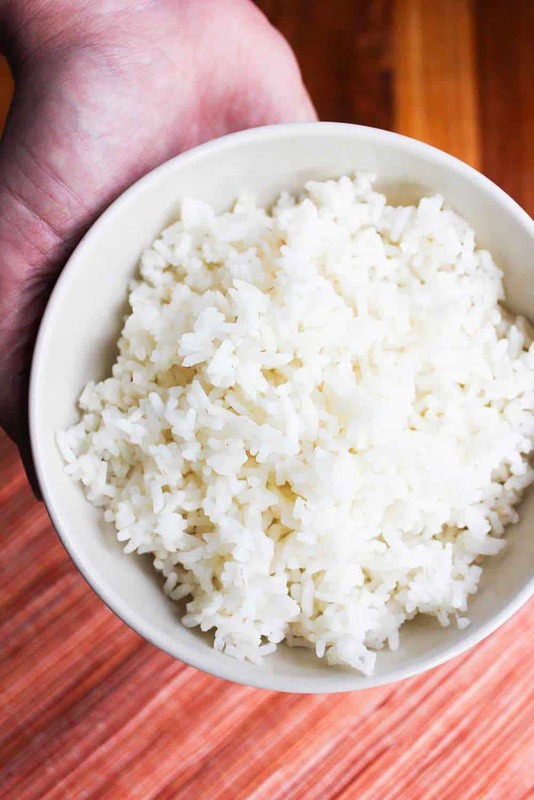 Perfectly steamed rice is a must for this iconic dish. Next time you bake a ham or make Slow Roasted Pork Shoulder, be sure to save the bones to simmer in this incredible dish. Or, you can use smoked ham hocks, just ask your butcher at your supermarket. If they don’t have any available, they can get some for you no problem! You won’t believe how your house will smell when you make this iconic N’awlins dish! Be sure to have your favorite hot sauce handy…and as is often the case, this is even better the next day! This Red Beans and Rice recipe is just so comforting, and literally keeps you and your loved ones coming back for more and more and more!! This New Orleans Red Beans and Rice recipe is just so comforting, and literally keeps you and your loved ones coming back for more and more and more!! 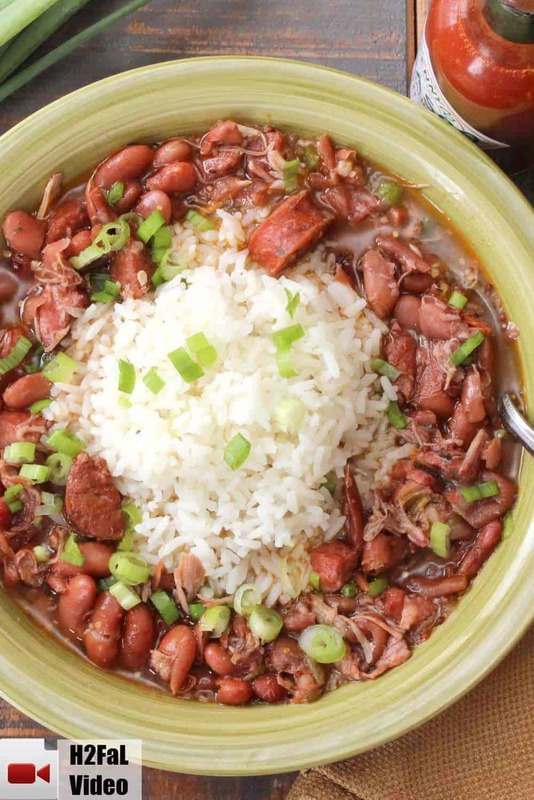 No, go and make some amazing New Orleans Red Beans and Rice! 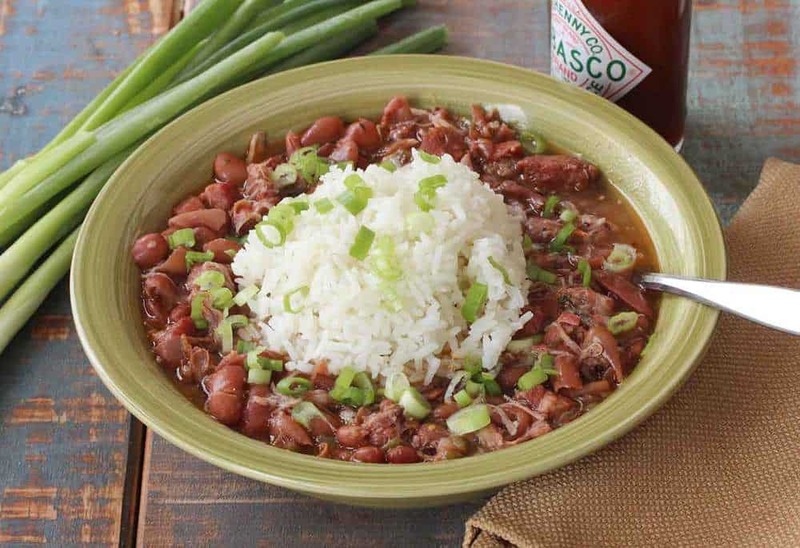 This recipe for New Orleans Red Beans and Rice is one of our all-time favorite Cajun dishes. So deep in flavor and has just enough kick to make your eyes light up and your tummy say "Howdy!" 100% Loon Approved! Put the dried beans in a large pot of water (the beans should be covered by at least 2 inches of water). Soak the beans overnight and then drain. Combine the beans, 1 gallon plus 2 cups water, the ham bone, and bay leaves in a large stock pot and bring to a simmer over medium heat. Meanwhile, in a large skillet, cook the sausage and ham over medium-high heat until crispy and brown, about 8 minutes. Add the onion and cook until softened, 5 minutes more. Add the tomato, jalapenos, garlic, mustard, vinegar, salt, thyme, black pepper, and cayenne and continue to cook until the mixture is hot and the ingredients have softened, an additional 5 to 8 minutes. Scrape the sausage mixture into the pot of beans. Simmer slowly, uncovered, stirring occasionally, until creamy and tender, about 3 hours. Approximately 10 minutes before the beans are done, use a wooden spoon to smash some of the beans against the inside of the pot. Remove the bones and bay leaves. Serve over hot steamed white rice with sliced scallions and hot sauce. Can you cook this recipe on the slow cooker? If so, what is a suggested length of time? What shrimp? I didn’t see shrimp on the ingredients list! Hi Steven, where did you see/hear something about shrimp for this recipe? There’s definitely no shrimp in this red beans and rice recipe. Sorry for any confusion!! Ha!! Well, I must have had jambayala on my mind! Just disregard the “shrimp” part of that comment! We respond to a lot of a comments, so I must have gotten mixed up!! Would love to try this but wondering can I make this in insta pot? If so how long will it take ? 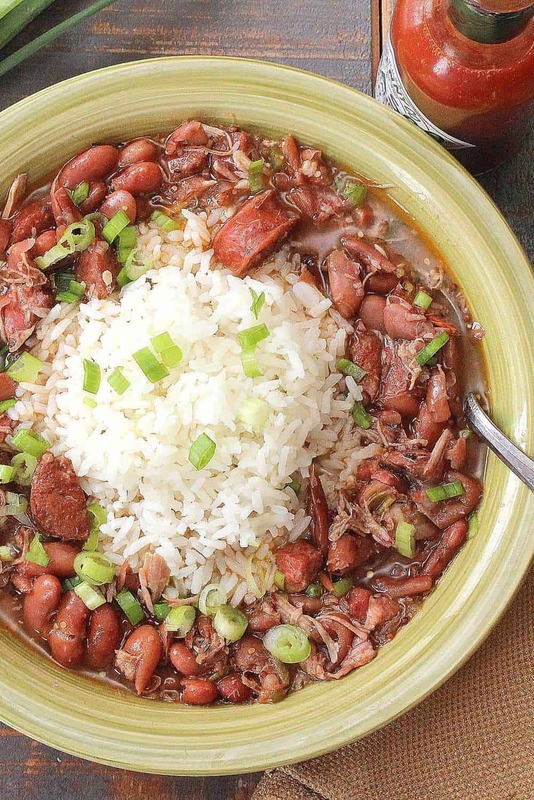 New Orleans Red Beans and Rice is a New Orleans dish, not a Cajun dish. It’s traditionally served on Mondays. I know this seems minor but not to New Orleanians that have to combat that, ‘no, we are not Cajun, we are New Orleans.’ However, you have an excellent recipe says this New Orleans Yat! Okay! Thanks for the clarification! We do LOVE NOLA! this looks amazing, I am wondering how smoked pig neck would taste in this recipe? otherwise guess i could get the smoked shanks. The smoked pig neck would be great! Will still give that same great smoked pork taste. Let us know what you go with! Pingback: Friday Favorites for May 26 2017 - The Allen Table - tshirts & recipes! 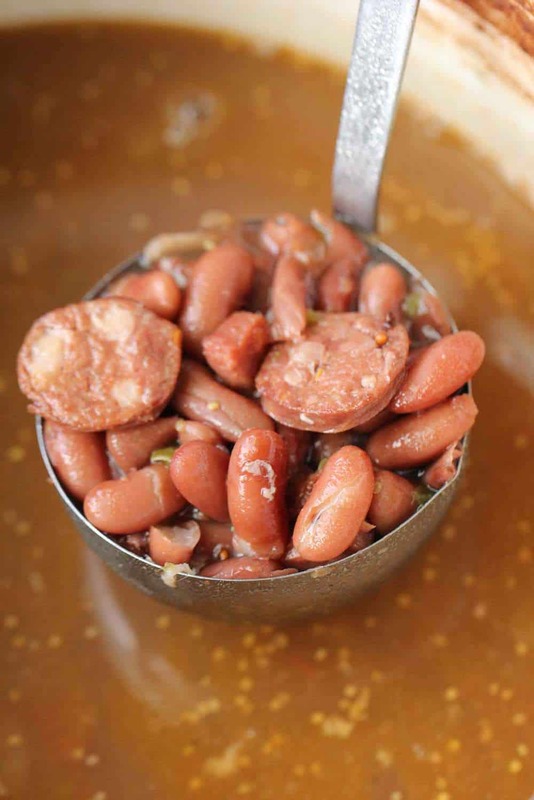 Can I substitute the andouille sausage for smoked sausage? I love spicy cajun food but my husband has stomach ulcers and can’t eat spicy foods..
Hi Vicki! Sure, you can substitute any kind of sausage you like. It’s still going to have the wonderful Cajun flavor. Let us know how it turns out. This is one of our favorites! Is there a substitute for thyme seeds? I’ve not seen those in my local stores. Another spectacular looking recipe! Can’t wait to try this one soon. You have some real good looking food! Love your site in general. Hi Katia! We love all things CAJUN!!! Thanks for stopping by and please come back often!